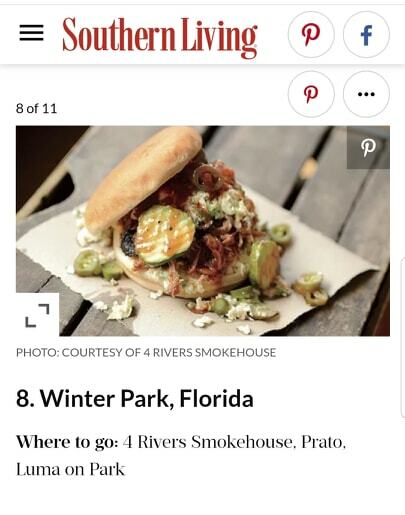 On Facebook I’ve shared links a few times today: Southern Living Magazine named Winter Park the 8th BEST Foodie Town in the South! Yep, THE SOUTH. That’s a pretty big geographic area. Others on the list range from as far west as a restaurant in Texas to as far, uh, north, as Virginia. And, yes, hat tip, to our friends up the road in St. Augustine, they were named #1! Since moving here in 2006, Winter Park, and more broadly, yes, all of Orlando, are extraordinarily different places. The quality of food offerings, as well as the variety, all that much greater. And delicious! The Southern Living piece specifically mentions 4 Rivers Smokehouse, Luma on Park & Prato. All great Local go-tos, for sure. 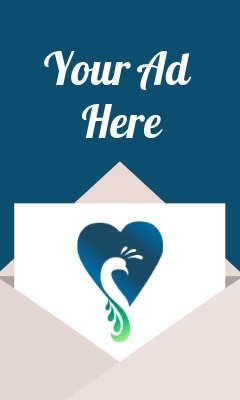 And the people behind those Local culinary entities surely among the individuals who have helped to propel Winter Park upward and forward in the eyes of foodie LUVers, whether they be Local, regional or even national, as here. A big hat tip, as well, to the dynamic duo that is James & Julie Petrakis of Ravenous Pig and Cask & Larder fame, as well as John Rife from East End Market. These guys are Local foodies who have definitely help the Local food scene, garnering it lots of new exposure since beginning their respective businesses. 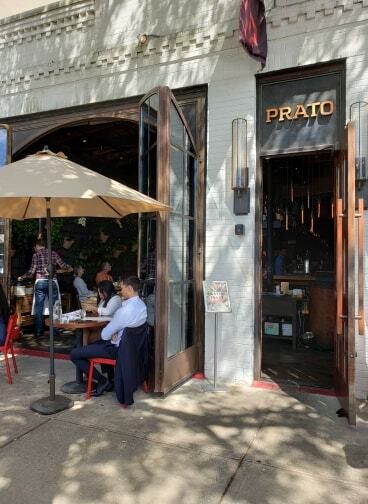 Specifically mentioned by Southern Living, Prato. But the list of Local restaurateurs who have helped get us here is long, and deep. From JoAnn McMahon with the 310 Restaurants to George Paul who’s been making up his cookies & chicken salad for over 30 years to Park Avenue staples like Richard Pannullo at Pannullo’s , the couple behind Cafe de France, and Vincent Gagliano at Chez Vincent & Hannibal’s in Hannibal Square to now Rhys Gawlak & crew at Swine & Sons, to Andreas Corton at Black Bean Deli. From the avant garde to the comfortable, the inventive to traditionally awesome, we have more choices now than ever before. Winter Park, your foodie cup runneth over. 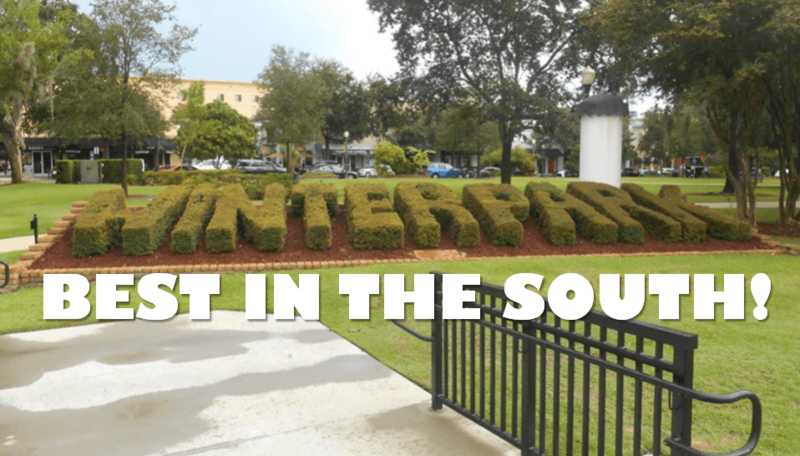 Our Beautiful little town of Winter Park is such a treasure. Congratulations from Joanne McMahon who is the owner of all 310 restaurants one in beautiful Winter Park, Lake Nona and Lake Eola in Orlando. Joanne, also owns Blu on the avenue, and is in the process of renovating the old Park Plaza Gardens restaurant. This new adventure will be a steakhouse. Congratulations Joanne!!! So very happy for you. Plan to write about Bovine soon. Already spoke with Joanne about it, but didn’t seem the right time then. Looking forward to it!